This week I made my way back to sunny Las Vegas, Nevada. I went with a group of friends to enjoy March Madness (Go Vols). The trip had perfect timing; while Nashville was trying to decide what season it was, Vegas was gorgeous and 80 degrees. It was the perfect weather to jump in the pool and make some new aquatic friends. 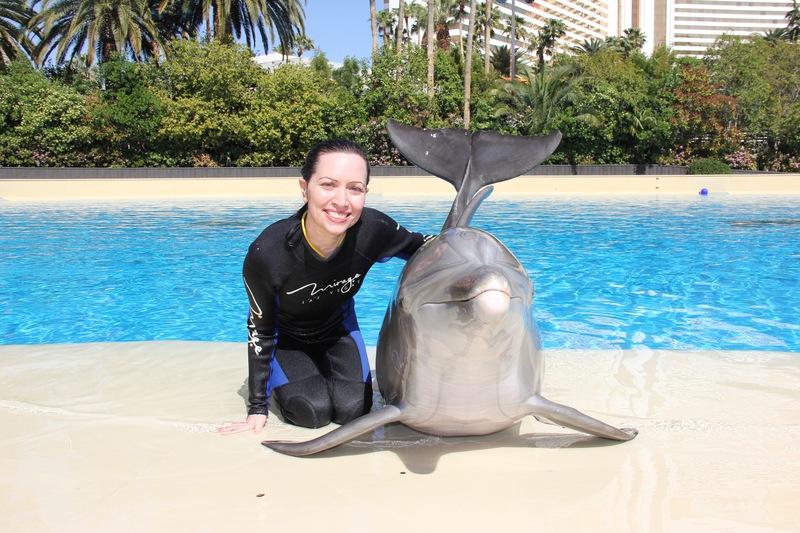 I went to Siegfried & Roy’s Secret Garden & Dolphin Habitat to spend a day as a dolphin trainer. 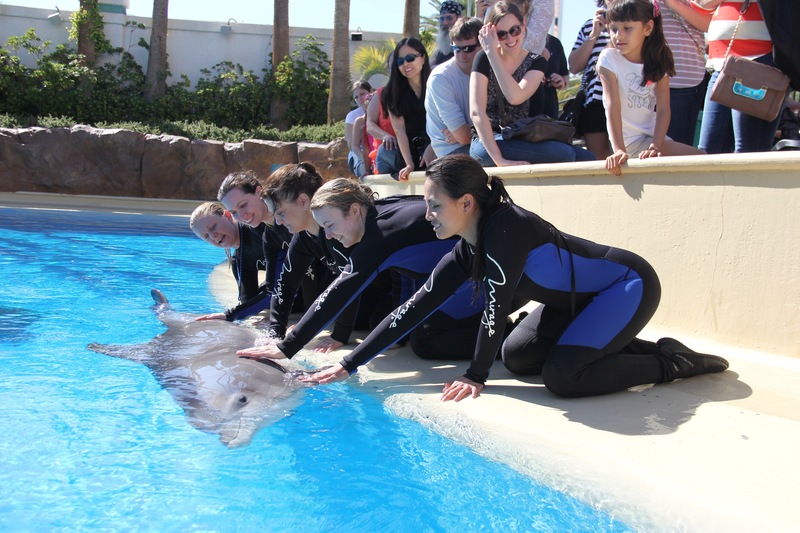 We started with a tour of the facilities and the 2.5 million gallon dolphin habitat. I have no idea exactly how big 2.5 million gallons is, but I can safely say it is a lot larger than Peyton Manning’s 3.2 gallon tank I have in my office. Part of tour took us below for an awesome underwater view. The dolphins are pretty curious so a few came to investigate who we are and what we were doing. Our day started with feeding the younger, adolescent dolphins. MiraMar, above, is approximately 2 1/2 years old. 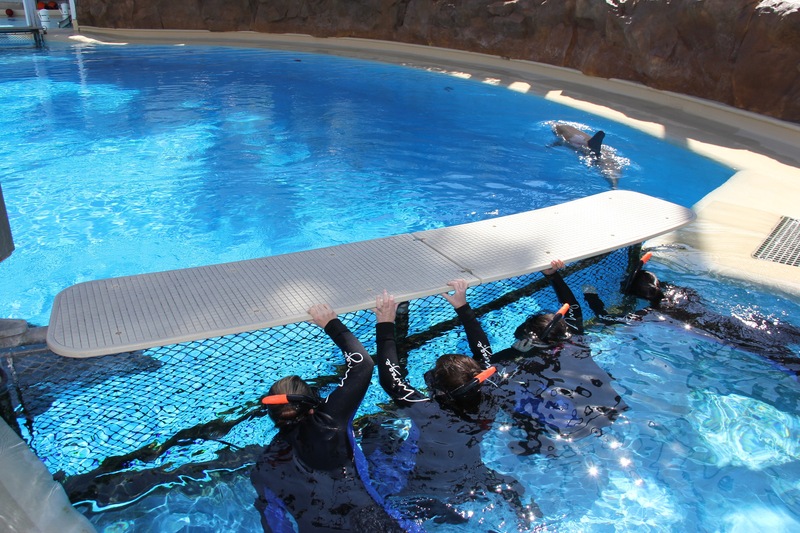 Part of our job was to reinforce the training the dolphins had already received. 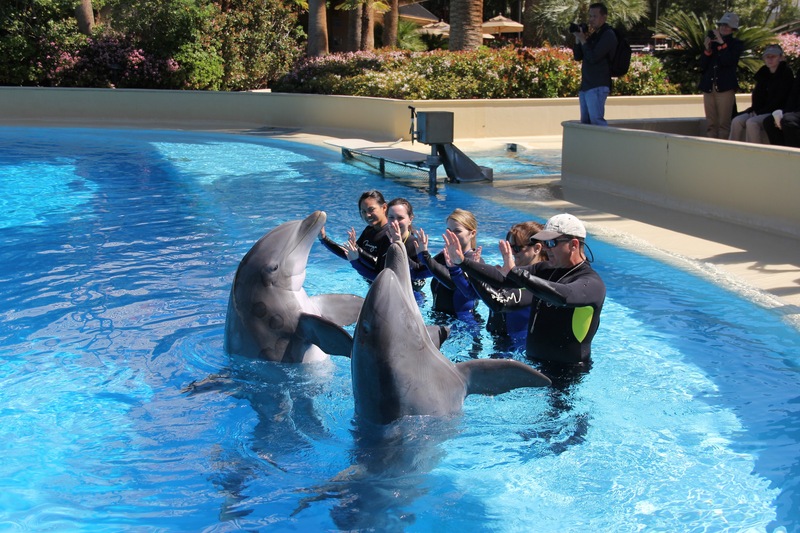 All of the “tricks” the dolphins do are extensions of their natural behaviors for the dolphins that they do on their own in the wild. 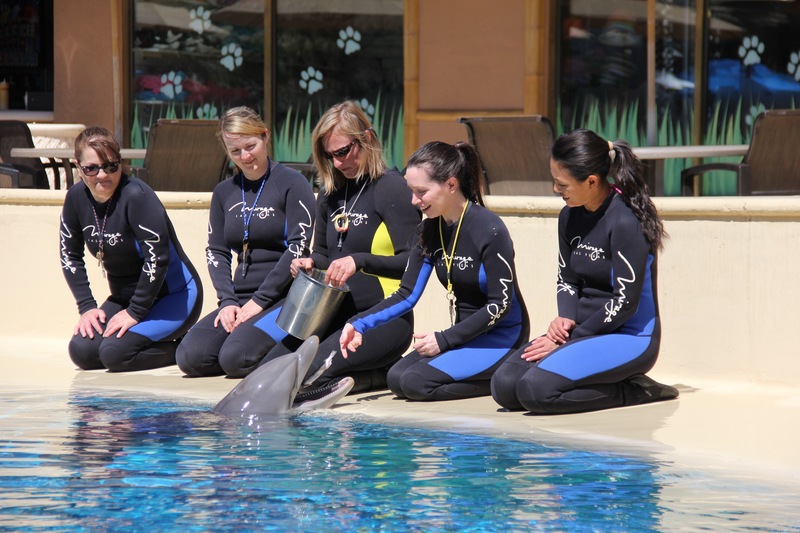 The trainers condition the dolphins to associate the jumps, spins, flips, with specific hand signals. If they do it right, they get a reward. I’m getting to know MiraMar and giving him a delicious fresh fish (sorry Peyton). The dolphins eat 15-25 pounds of fish and squid per day. Here are the three youngest (Bella, K2, and MiraMar) having some fun and getting some exercise. After we were done with the youngens, we moved on to another pool to spend some time with Beetle. Beetle is around 10 years old and an absolute sweetheart. 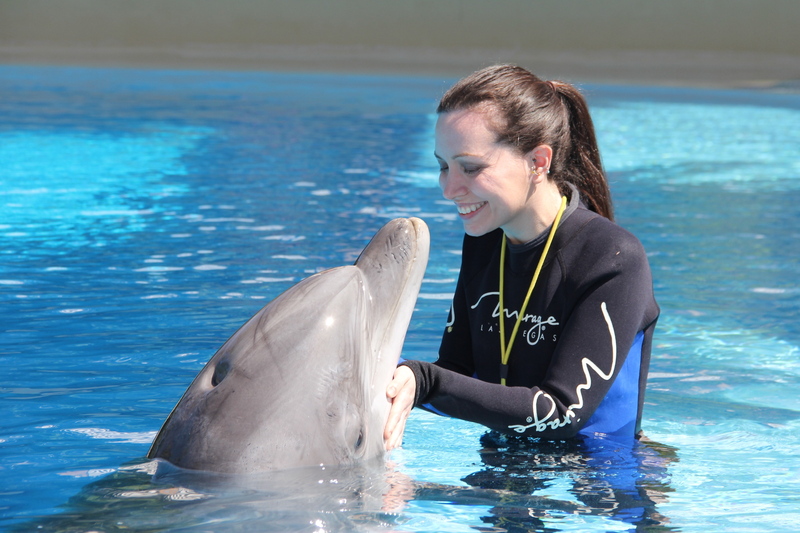 He was kind enough to give us lots of dolphin hugs and kisses. He seemed like a very happy boy. He is also a very heavy boy. 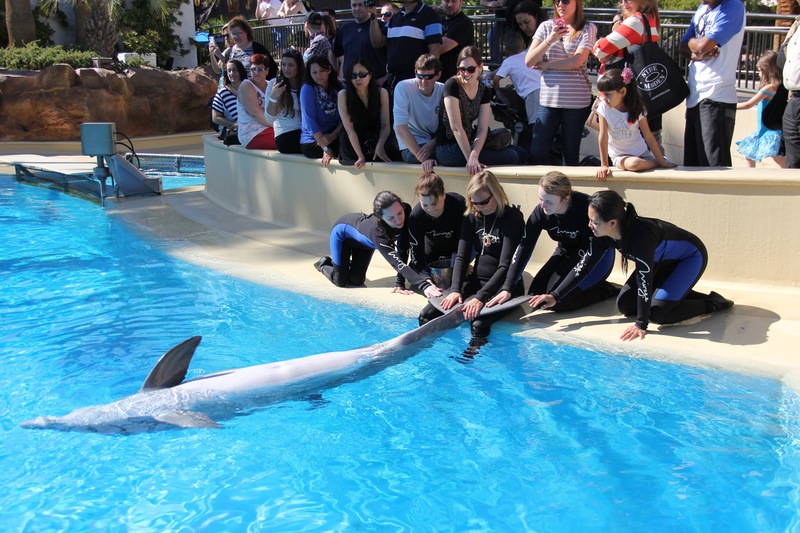 They were practicing socializing the dolphins with each other, so they pulled K2 away so MiraMar and Bella could work together. 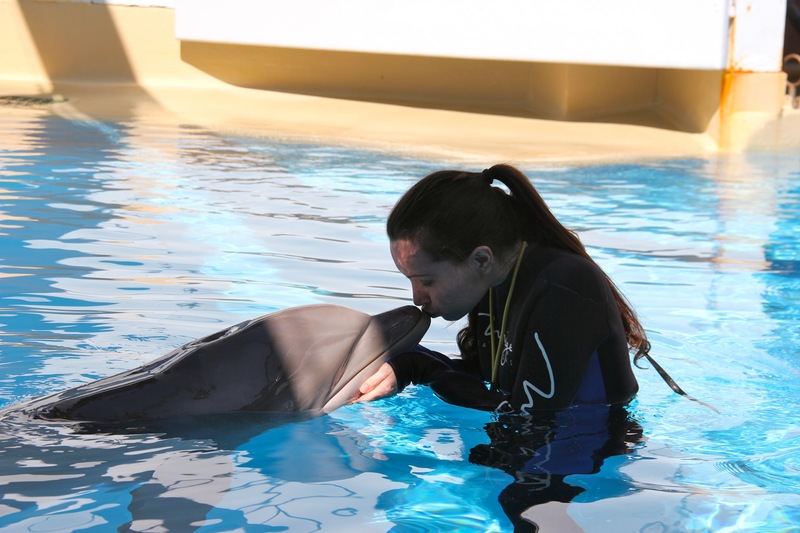 They used that time to work with K2 on his signals, and that meant more dolphin kissed for me. Incidentally, K2 is named after the charity organization, K2 Adventures Foundation. After lunch we hopped back in the pool for some swim time with Osborne. I swam out to the center of the pool and extended my left hand and waited for Osborne to meet me. He swam straight towards me, placing his dorsal fin right in to my hand. I grabbed on and he towed me along to the shore. 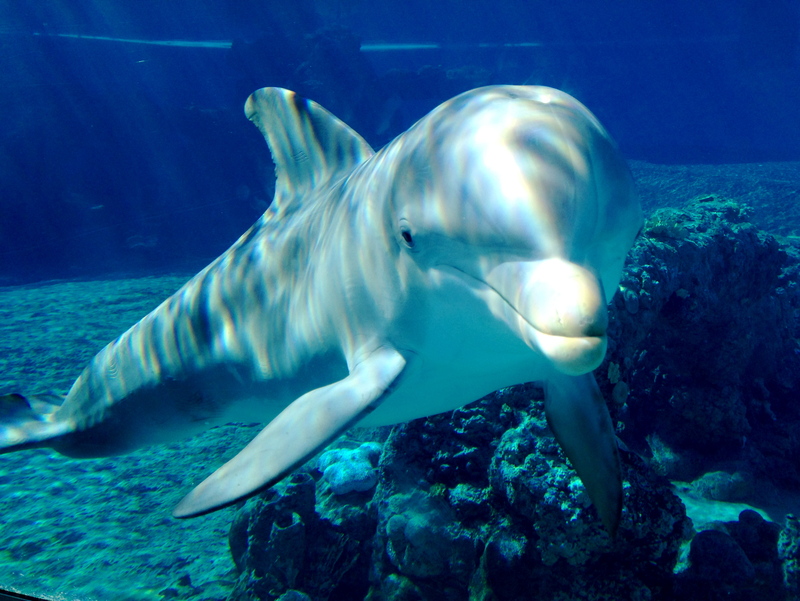 Dolphins are surprisingly fast, and can go approximately 22 miles per hour. That might not seem quick, but just wait until you are being pulled behind an aquatic mammal. Lightning hopped out of the pool for a photo. Just when I thought we’d done everything we could, our day wasn’t close to being over. 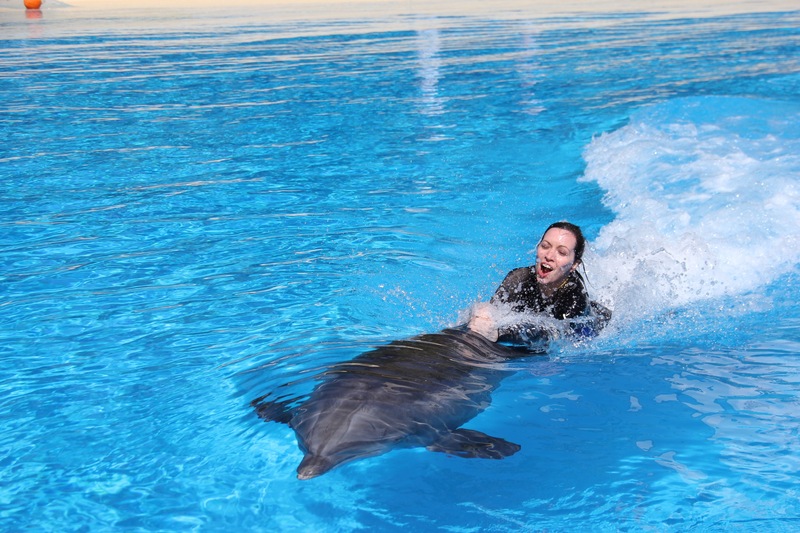 We had yet another training session with the dolphins. Next, we moved on to some underwater time. We strapped on snorkels and went below to see the world as they see it. it was really cool to hear their vocalizations underwater (which are made with their blowholes rather than their mouths). 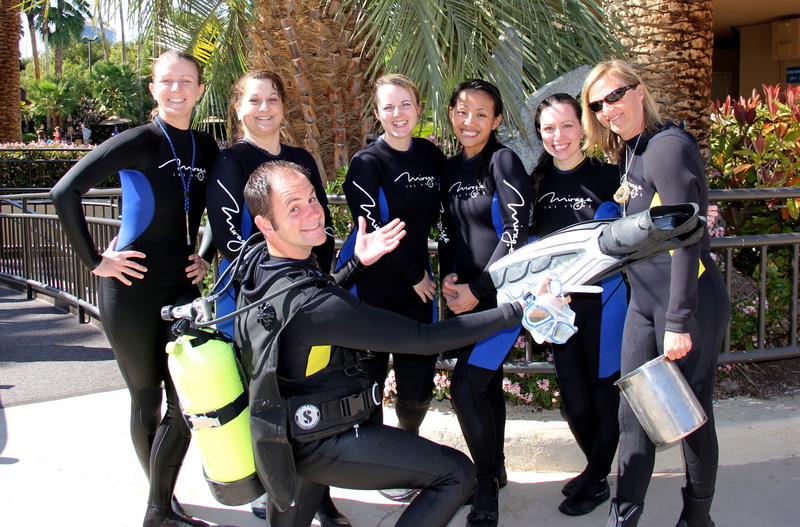 After snorkeling, we went to spend some time with the ladies. Above is Huf N Puf, who just turned 14 a few weeks ago. Finally, we got to spend some time with Duchess, the matriarch of the family. 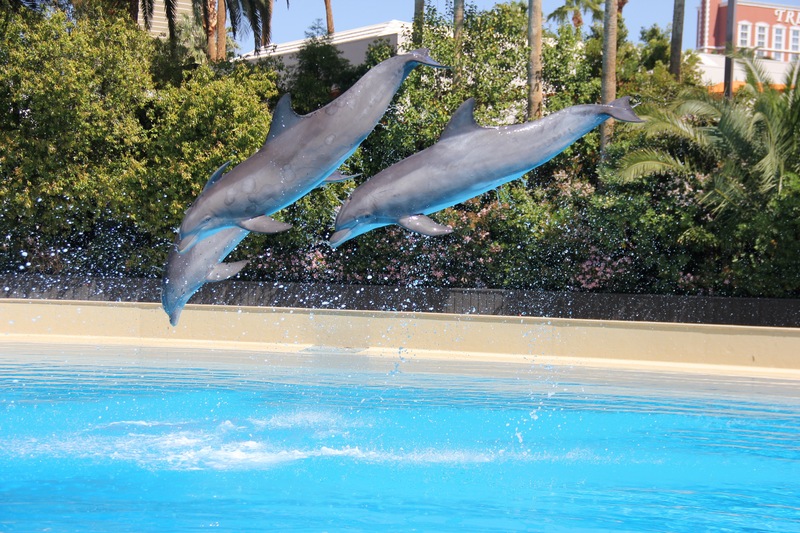 Duchess is 32 and has been at the Mirage since the habitat opened. She is a very big girl, weighing in at just over 500 pounds. 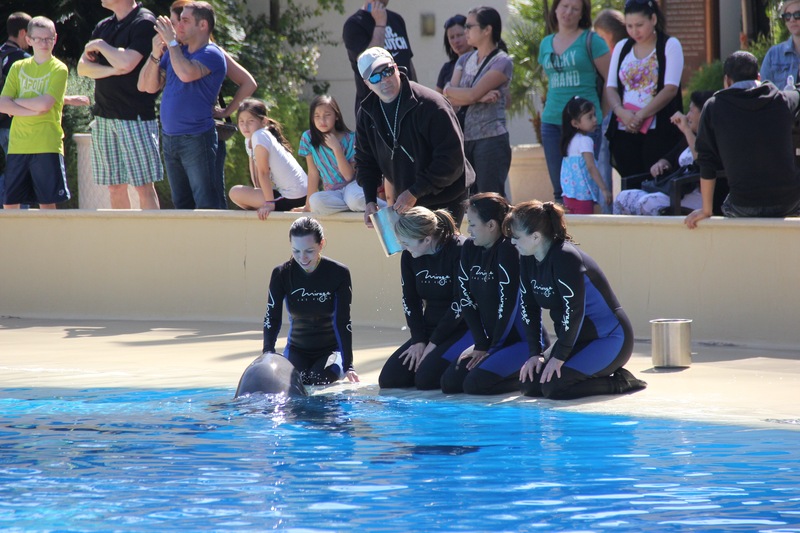 The trainers at the habitat get the dolphins to go through a standard medical routine in case they might actually need treatment. By getting them to randomly go through the motions when they don’t need special care, it makes it easier to collect blood or other samples when it is needed. For example, Duchess is upside down presenting her tail because blood is collected from a vein in her fin, just like blood is collected from our forearms. However, no samples were taken the day I was there. At the end of an amazing day, we stopped for a picture with some of the trainers. While the dolphins gave us a very unique experience, the day would not have been possible without the humans who work with them. The next day we began our morning with a trip to the Bellagio spa, for several hours of relaxing and detoxifying. 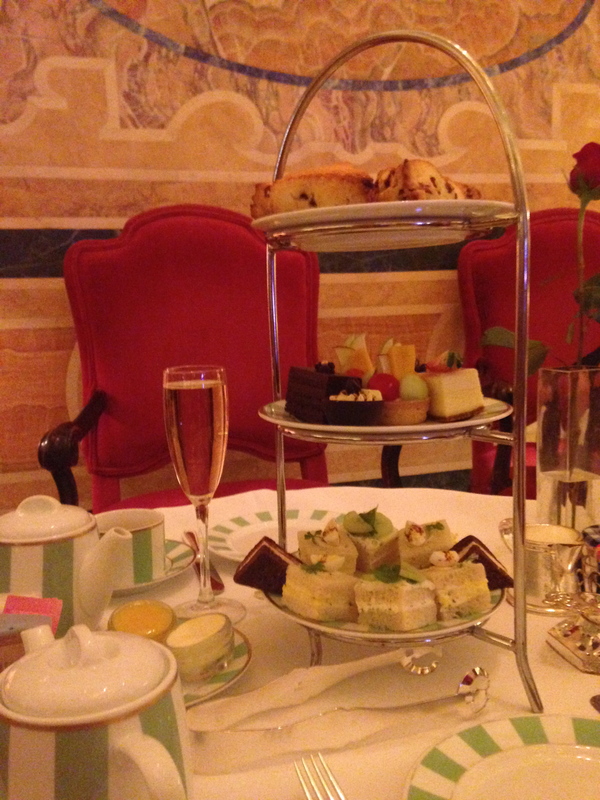 After the spa, we made our way downstairs to Petrossian for a proper tea service. It was possibly one of the best meals I’ve ever had. Along with a cup of yummy vanilla jasmine tea, I had mint cucumber watercress, chickpea goat cheese, and quail egg salad sandwiches, all of which were delicious. I absolutely devoured them as fast as I possibly could. After the sandwiches, I moved on to the scones. I tried lemon curd and clotted cream for the first time, both of which I suspect I’ll develop addictions to. The mini tarts and cakes were also indescrible. Along with the tea, we got a few glasses of champaign to kick off our day. Why? Because it’s Vegas. We enjoyed tea so much that we plan to make a habit of tea time together once we are back home. 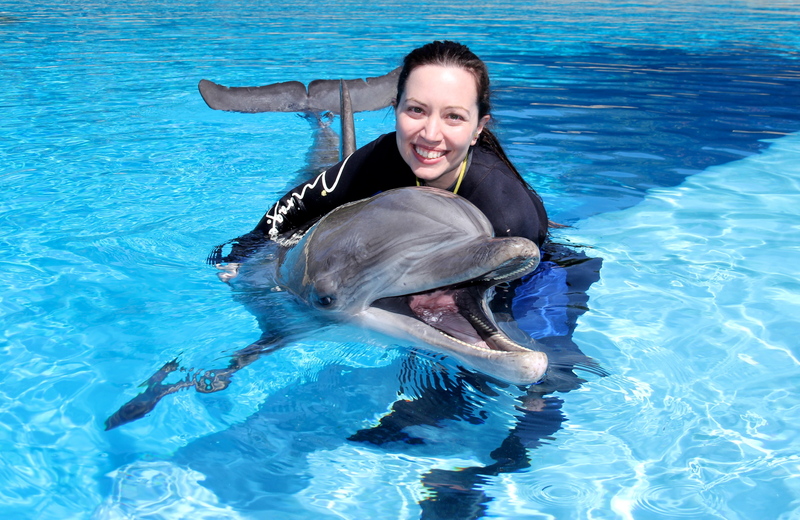 I was under the impression that dolphins had an organ in their foreheads called “the melon” that they used to make sounds, and that the blowhole was solely for breathing. Am I misinformed?